The “Security Perimeter” is part of a North American Union (NAU) agenda linked to a “New World Order” objective. “Free Trade” architects had always envisioned the NAU — an anti-democratic construct which relies on secrecy to implement.Neither Canada’s elected Members of Parliament nor unelected Senators who are mandated to specifically protect Canada’s Parliamentary traditions, have sought to speak out against the continued efforts by an elite clique to assimilate Canada into a “New American Union”. It is apparent that Canada’s Parliament is comprised of traitors, without any integrity, commitment to upholding their Parliamentary Oaths as loyal representatives of the diverse people of Canada. or substantive love for Canada.Elizabeth May who is the leader of the Green Party of Canada is the only Member of Parliament who continues to be a voice of Canadian sovereignty on Parliament Hill. 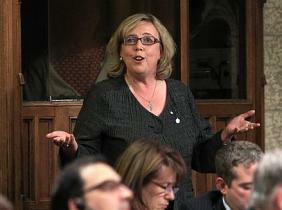 “Bi-lateral and Tri-lateral negotiations – between Canada, United States, and Mexico – to “harmonize” national standards and rules are continuing, notwithstanding the reported demise of the Security and Prosperity Partnership (SPP), proposed in 2005, that was exposed and discredited by an effective grass-roots awareness-raising campaign,” states Elizabeth May. Apparently gone are the days of passionate champions of Canada like Sir John A. Macdonald, Sir Wilfrid Laurier, Tommy Douglas and Pierre Elliot Trudeau. Deep integration between Canada and the United States is not a theory or a fear – it is a reality. For several years now, government task forces and working groups have been quietly harmonizing Canada-U.S. programs and procedures, without any input from the Canadian public. The Security and Prosperity Partnership of North America (SPP), agreed to by the leaders of Canada, the U.S. and Mexico in 2005, is moving Canada quickly toward a continental resource pact, a North American security perimeter, and harmonized military and security policies. Working groups composed of bureaucrats and corporate leaders are quietly putting this “partnership” into action, and to date only industry “stakeholders” have been consulted. SPP is designed to create the New American Union often dubbed the so-called “North American Union” (NAU). If you don’t believe that a so-called NAU agenda exists, trying calling your local Member of Parliament. You will like receive an upfront “no comment”, or if you leave a message, don’t expect your call to be returned on the subject. The NAU with little doubt, is the worst scandal in Canadian political history, covered-up, by the mass-media ownership, that is part of a treasonous cabal. The SPP has morphed into the so-called “North American Security Perimeter” is part of the NAU agenda. On 7 December 2011, President Barack Obama and Prime Minister Stephen Harper announced the Beyond the Border Perimeter Security and Economic Competitiveness Action Plan. It is apparent that we, as Canadians, can no longer rely on the major parties to defend our vital national sovereignty. Canadians need to wake up now, or face assimilation under the collusion of political elites, and their collaborators who have sought to sell-out our nationhood. This entry was posted on April 29, 2012 by Amir Alwani. It was filed under Canada, news, sovereignty, tyranny .